The epitome of unadulterated simplicity, the wobbly slab of silky soft beancurd came smothered in a lightly torched, creamy sea urchin paste. Granted the dish proffered no visual stimulation but the minute we sampled the first mouthful, all conversation ground to a halt at our table. Yes, the dish was so good that all of us were rendered speechless by the beancurd's ethereally light texture and the distinct sea urchin paste's delicate richness with a lingering briny-sweetness that hinted of the sea. Earlier, our dining companions had their tastebuds tickled by two inventive Appetizers: Ebi Pan ~ deep fried baguette infused with tiger shrimp (RM 6) and Mentai Tamagoyaki ~ Japanese omelette topped with salted cod roe, mayo & butter oat (RM 8) which we missed out because we arrived late. Drats! We were dining at Mikan, a newish Japanese restaurant in Damansara Perdana. It's a casual dining outlet with toasty and choco slate tiled walls, mellow lighting and comfy dining chairs that put you immediately at ease. Unsurprisingly, sashimi and sushi are something that Mikan takes huge pride in. The restaurant uses only Norwegian salmon trout (RM 20) for its sashimi; the fish's plump succulence is a joy to behold on the tongue and one can seriously overindulge on this brilliant offering without much prompting. We were also smitten with the Hazuki Sushi (RM 4/pc), every mouthful of the slightly chewy, superbly fresh slices of jade perch buttery tender to the bite. According to Mikan's director Casey Liew, the fish comes directly from his aquaculture farm so its freshness is uncompromised. He tells us that the fish's omega 3 content is even higher than that of salmon. Signature sushi rolls here that come highly recommended are the Volcano Roll ~ a flavourful vinegared rice roll that's filled with Leek, Bonito Flakes & Mikans No.1 sauce (RM 18) and the sublime Dragon Roll with scrumptious fillings of tiger prawn, avocado and shrimp roe (RM 16). After cleansing our palate with Sencha (RM3) infused with GeMaicha (roasted rice), we devoured a plate of Ebi Niniku Mayo Yaki ~ Tiger Shrimp skewered and topped with garlic mayo sauce. An indulgent treat that smothered in an unctuous garlicky sauce that we all fell for hook, line and sinker. The Buta Kakuni ~ Japanese-style Simmered Pork (RM 22) is a timeless classic that begs to be eaten with bowls of plain rice, especially the hearty, mildly briny and sweet sauce. Porcine fans would be in seventh heaven the minute they sample Mikan's delectable Pork Lard Fried Rice (RM 6); fluffy rice brimming with smoky 'wok hei' and liberally studded with crispy dices of pork lardons. Wrapping up our meal with a glass of organic Green Papaya Juice (RM 8), we learned that the supply of organic Exotica III Papaya comes from the Liew family's farm in Melaka. "The juice is enzyme rich, a natural antioxidant drink that cleanses the body's internal system," says Casey. Much to our surprise the green papaya juice turned out pleasantly agreeable; its mild sweetness is refreshing without any sappy overtone as one would expect from raw, unripe fruit. Mikan is quite a discovery for us and hopefully more foodies will feel the same way too. The menu has much promises and we intend to explore it fully on another occasion. It is said that every visitor to a Chiu Chow home will always be welcomed with a cup of freshly brewed Chinese tea. This traditional Chaozhou's social etiquette is similarly observed at the Pak Loh Chiu Chow restaurant from the day it opened until now. Chiu Chow or Teochew or Chaozhou is a city in the eastern Guangdong province; famed for its humble, rustic dishes such as porridge known as a myu'eh, seafood soup, cold flower crab, pan-fried oyster omelet and braised goose fillet. In Kuala Lumpur, Chiu Chow food enthusiasts can descend on Pak Loh Chiu Chow restaurant (the “Golden Sister” of Hong Kong's renowned Pak Loh Restaurant) for their fill of the cuisine. Opened in 2005 at the Starhill Feast Village, it is now helmed by Hong Kong Chef Alex Au Ka Wah or Wah Jai who has worked at the original Pak Loh for over a decade. He picked up the finer rudiments of Chiu Chow cooking from his father. For the media preview, Chef Au dazzled us with existing and newer signature mainstays. To start the ball rolling, we feasted on Cold Flower Crabs with Sweet Vinegar and Shredded Ginger Dip. The crabs' inherent sweetness is the focus here with an accompanying vinegar and ginger dip to counteract any fishiness. The only snag is tackling the carapace can be a messy affair so you wouldn't want to eat this in polite company. 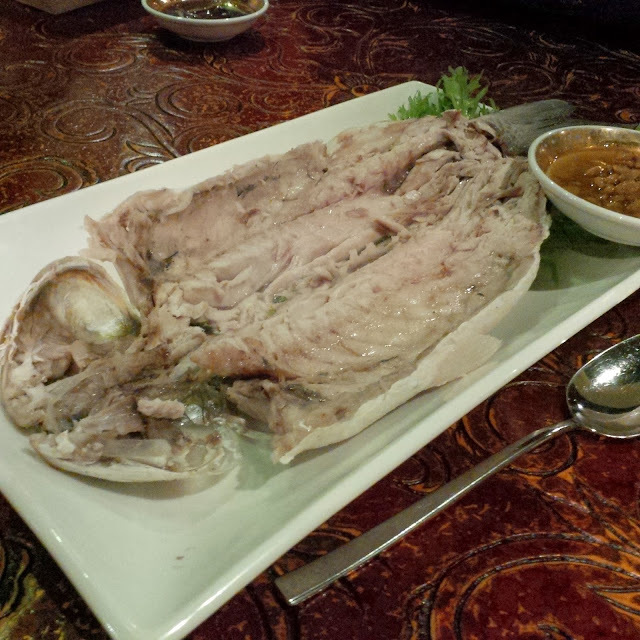 Then came the Steamed Grey Mullet with Preserved Soy Bean Dip. This scaly fish has fine, creamy white flesh with a faint muddy nuance hence it's served with the mildly briny dip to mask that. I took quite a fancy to the preserved soy beans which remain whole and not mashed like taucheo favoured by the Hokkiens. Instead of discarding the fish scales, they are deep-fried and served as crisps to munch on. Talk about waste not, want not. The Chilled Pork Jelly is by far my favourite. Made from deboned pork knuckle meat that has been braised for 6 hours with a medley of Chinese herbs, the terrine is hearty, deeply flavourful and marble-smooth; the wobbly gelatinous texture giving way to scrumptious soft chunks of pork fat, skin and meat that taste like delectable solidified bak kut teh. Crispy, crunchy textures dominate the Crystal Crispy Duck with Mushroom and Water Chestnuts – a gossamer-light deep-fried roll filled with slivers of duck, tender mushroom slices and crunchy bits of water chestnuts. Another excellent dish that I'd return for is Deep-fried Baby Oysters with Plum Sauce. Biting into the little plump, juicy molluscs, bursts of faint metallic sea-brininess intermingled with unctuous plummy sweetness will be unleashed onto your palate. Heavenly! Of course, Chef Au could do no wrong with Pak Loh Chiu Chow's definitive signature dish – the classic Slow-braised Goose, Pork Fillet, Pork Intestine, Pig's Ear, Egg and Bean Curd Combination. Its unpretentious earthy, home-spun flavours remind me of Mom's vintage tau eu bak (braised pork in soya sauce). My absolute fave is the tender crunchy cartilage that streaked the pig's ear! Tread warily when partaking the Steamed Bombay Duck Fish with Preserved Turnips and Glass Noodles. This little fish's unusual name is said to be a corruption of the specie name bommaloe macchli. Enjoy its fine meat but hair-breadth bones abound so beware and go slow. Its natural pungency is deftly tempered by the chef using preserved turnip, soya sauce, chopped spring onion and Chinese rice wine. Don't miss out on the slippery and superbly yummy noodles that line the plate. Having absorbed all the concentrated liquid pooled at the bottom, they're out of this world. Mindful of Starhill's posh clientele, Chef Au's creation of Fortune Parcels of Goose Liver with Superior Stock truly befits the restaurant's classy stature. Personally, I find the delicate good liver-stuffed "parcel" way too rich. Perhaps it also didn't help that yours truly was slipping into a semi-food laden stupor from the surfeit of delicacies earlier. Humbler offerings of Stir-fried Prawn with Preserved Pickles and Coriander, and Braised Roasted Pork with Vegetables should evoke waves of nostalgia in older folks like Mom and Dad. They may start waxing lyrical about the good old days the minute they try these. Rice fiends will rejoice over the Chiu Chow Baked Yam Rice with Dried Shrimp and Peanut in Clay Pot. Pheasant food at its best but its heartwarming honest-to-goodness deliciousness is something you'd never tire of. Some sweet surprises await should you wish to wrap up your visit to Pak Loh Chiu Chow on a sugar rush. Admittedly, the spongy-soft Sweetened Fish Maw with Gingko Nut and Chiu Chow Crispy Noodle served with “San Tou” Vinegar and Crystallized Sugar are most unusual but be forewarned that the traditional delights may be an acquired taste for some. 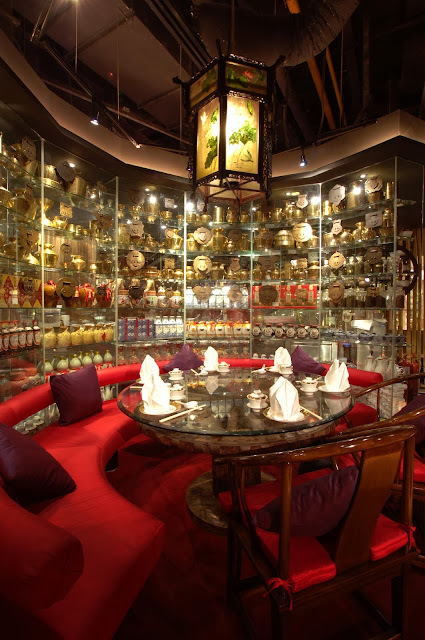 With its striking red and gold ambience that mirrors its sister outlet in Hong Kong, Pak Loh Chiu Chow's cozy atmosphere is further enhanced with ornate furniture brought in from China. Prices start from from RM14 onwards for starters, RM15 onwards for main dishes and RM9 onwards for dessert. 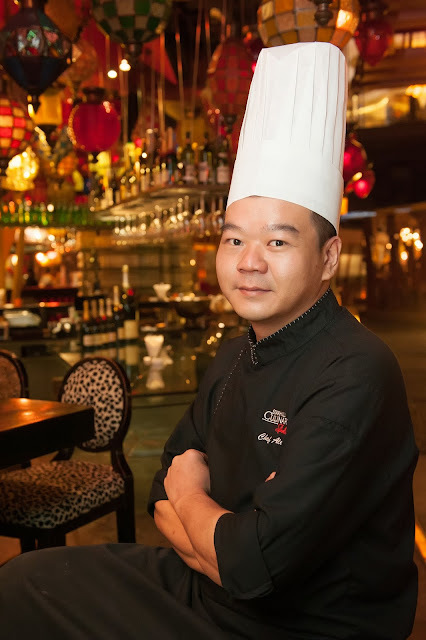 According to Director of Autodome Bhd, Jeremiah Tan, "Pak Loh Chiu Chow already offers a unique gourmet experience but we want to raise the bar with this new menu; by showcasing the distinctive flavours of Chiu Chow cuisine that deliver an unprecedented level of authenticity." Well, the proof of the pudding's in the eating so drop in and judge for yourselves. LG12 Feast Floor, Starhill Gallery, 181 Jalan Bukit Bintang, Kuala Lumpur.